Are you familiar with sustainable seafoods? The Aquarium of the Pacific is a huge supporter of sustainable foods! Each year they hold sustainable seafood samplings(WOW! That's a mouthful!) at their beautiful location in Rainbow Harbor, Long Beach! 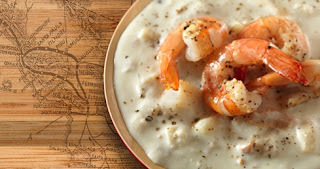 Their latest samplings comes in for of their BEST OF THE WEST CHOWDERFEST! Aquarium of the Pacific invites the public to savor sustainable seafood chowders, prepared by local chefs while learning about local and responsible seafood choices. 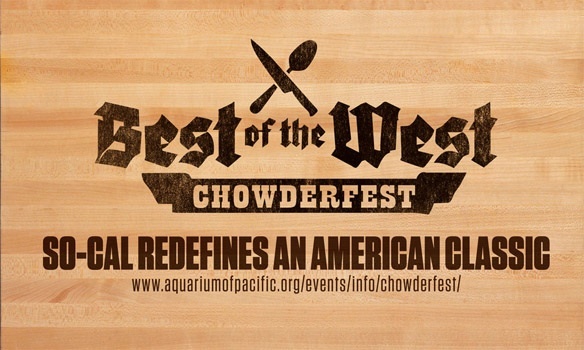 WHAT: Savor sustainable seafood chowders as chefs compete to create the best dish at the Aquarium of the Pacific’s annual Best of the West Chowderfest. Presented by the Aquarium’s Seafood for the Future program (SFF), Chowderfest will feature award-winning chefs who will work to redefine chowder in a SoCal style, using fresh and local sustainable seafood. Guests can delight in daring chowders prepared with well-managed California seafood, including urchin, spiny lobster, spot prawns, rock crab, Kellet’s whelk, Carlsbad Aquafarm mussels, local produce from Weiser Family Farms, and more. 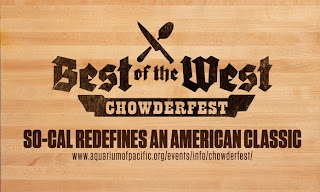 “The Best of the West Chowderfest is not only a celebration of sustainable local seafood, it is also an adventurous cooking challenge,” said Kim Thompson, Aquarium of the Pacific Seafood for the Future program manager. · Sample one-of-a-kind seafood chowders created by award-winning local chefs with local sustainable seafood. · Cast your ballot for the best chowder of the day and become eligible for a variety of prizes. · Learn more about local seafood, fishermen, and farmers. WHEN: Saturday, March 9, 2013, 11:00 a.m. – 3:00 p.m.
FREE for children under 3. Other participants include: A Sustainable Kitchen, The Growing Experience, The Culinary Liberation Front, FishWatch, The Fish Contamination Education Collaborative, Edible Westside, and more. SFF: The Aquarium’s SFF program is a nonprofit seafood advisory program made possible by Pacific Life Foundation and SAVOR…Long Beach. Educational partners include the National Oceanic and Atmospheric Administration’s FishWatch and the Fish Contamination Education Collaborative. Consumers can find responsible seafood dishes and featured local seafood selections at the following SFF partner restaurants: Bluewater Grill (Newport Beach, Redondo Beach, and Tustin); Parkers’ Lighthouse, SlapFish, Gladstone’s Long Beach, and more; as well as seafood retailers such as Santa Monica Seafood. SFF is also working with Santa Barbara Community Seafood and the Dory Fleet Fish Market in Newport Beach as well as community groups such as the Culinary Liberation Front and Commercial Fishermen of Santa Barbara to promote local seafood. The public can look for SFF sustainable cooking demonstrations, hosted dinners, and the complete partner list by visiting seafoodforthefuture.org. Now for the cherry on the top of the sundae! Who wants Tickets to the Aquarium? Enter below for a chance to Win! We love all the sea creatures but our fav is the jelly fish and sea otters. I suddenly feel like eating some chowder! Yum! My son likes the star fish. I love the aquarium! What a cool competition. I would have loved to be at that event. I wish I would have heard about this sooner. Thanks for sharing. My favorite is the sting ray. I especially love the Aquarium of the Pacific because you can touch the sting rays. I hope I win so that I can take our 4 month old son - he loves looking at fish! I love the sea horses. My favorite animals are the otters. Could watch them all day! Everyone is Irish on St. Patrick's Day!